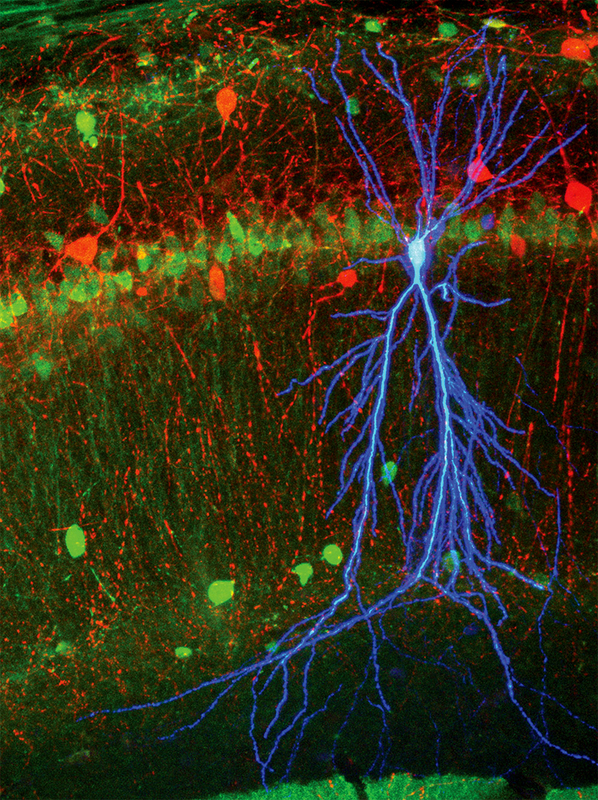 A stained pyramidal cell (in blue) in area CA1 of a mouse hippocampus. 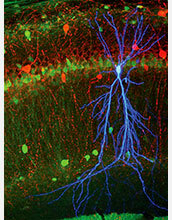 Neurons expressing calbindin are shown in green and inhibitory neurons expressing parvalbumin are shown in red. During intracellular recording of the neuron�s membrane potential, the pyramidal cell was filled with dye so it could be located and imaged. Neuroscientists at the California Institute of Technology (Caltech) have looked inside brain cells as they undergo the intense bursts of neural activity known as "ripples" that are thought to underlie memory formation. During ripples, a small fraction of brain cells, or neurons, fire synchronously in area CA1, a part of the hippocampus that is thought to be an important relay station for memories. "During a ripple, about 10 percent of the neurons in CA1 are activated, and these active neurons all fire within a tenth of a second," says Caltech graduate student Brad Hulse. "Two big questions have been -- how do the remaining 90 percent of CA1 neurons stay quiet? And what is synchronizing the firing of the active neurons?" Hulse and his colleagues used a novel approach to show how the combination of excitatory and inhibitory inputs to CA1 work together to synchronize the firing of active neurons, while keeping most neurons silent during ripples. The researchers used two techniques in tandem to monitor the activity inside a single neuron while still observing how the larger network was behaving. This in turn enabled them to piece together how excitatory inputs from CA3, a hippocampal region where memories are formed, affect the output of brain cells called pyramidal neurons in CA1. These neurons are important for transferring newly coded memories to other brain areas such as the neocortex for safekeeping and long-term storage. Ripples are thought to be the mechanism by which this transfer occurs.